This weekend was headlined by the hotly anticipated showdown between two former two-time Olympic Gold Medallists, WBO super feather champion Vasyl Lomachenko and WBA super bantam champion Guillermo Rigondeaux, who clashed on Saturday at Madison Square Garden in America's largest city, New York. Rigondeaux jumped up two weight classes to challenge Lomachenko for the Ukrainian's WBO crown and the 37 year old Cuban looked to be the much smaller man in the ring once the action began in this battle of southpaws. 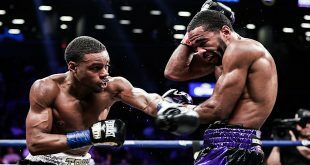 Surprisingly, the normally defensive Rigondeaux was the man going forward in the bout's early stages as he pushed Lomachenko back behind a sharp jab and the occasional attempt at a power punch. Both men went to the body as the action began heating up, with Lomachenko starting to mix in some offense after he had studied his opponent. In the third, Rigondeaux reportedly broke his left hand and it was about that time that Lomachenko began to close the distance on the Cuban, who resorted to excessive holding. Normally, Rigondeaux can control his opponents through evasive footwork, jabs and powerful lefts but once the left was taken away due to injury, the superbly skilled Lomachenko began to take control of the contest. 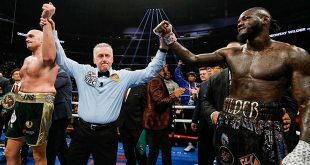 Rigondeaux lost a point for holding in the sixth, a round in which it became apparent that he had very little hope for anything other than a certain loss in this bout, after which his corner elected not to send their charge out for the seventh frame. Lomachenko improves to 10-1 (8), retaining the WBO super feather belt for the fourth time, while Rigondeaux suffers the first loss of his pro career, dropping to 17-1 (11). Lomachenko could head for the lightweight division and lucrative fights in 2018 while Rigondeaux's future is very uncertain after this disappointing outcome. Also on Saturday, there was a double world title bill on tap at London's Copper Box Arena in England, with IBF featherweight king Lee Selby and IBF super middle boss James DeGale putting their crowns at risk. Selby, 26-1 (9), had some rocky moments in overcoming previously undefeated Mexican Eduardo Ramirez, 20-1-3 (7), who proved to be rough and ready in his first world title opportunity. 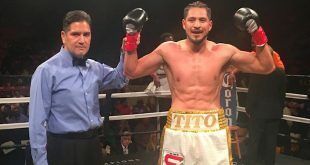 Ramirez had missed weight the day before and would therefore be unable to win the title if he defeated Selby and the Los Mochis man did apprear to be the stronger fighter in the ring. But Selby was unquestionably the more skilled of the two and it was his talents and greater edge in experience that overcame the challenger to post a 119-109, 118-110, 116-112 unanimous decision victory. Selby will reportedly next defend against domestic rival Josh Warrington in 2018 in what is expected to be a difficult fight for the Welshman champion. DeGale, 23-2-1 (14), wasn't so lucky as he was simply outworked by American challenger Caleb Truax, 29-3-2 (18), who had been given almost no chance of winning going into this bout. DeGale looked good early, hitting the aggressive Truax with some eye-catching shots but the visitor simply never gave up and the champion could not keep the challenger off for most of the contest. Truax was in control by the middle rounds and repeatedly punished DeGale on the ropes. The champion tried to mount a comeback in the later rounds but he could not overturn his rival's momentum. Winning a majority decision by scores of 116-112, 115-112 and 114-114, Truax becomes the new IBF super middleweight champion. DeGale faces a difficult road back if he is get a chance to regain his world title status and must improve his fitness as his fighting style relies on stamina rather than power. Heading back to America, the vacant IBF super feather belt was on offer at Mandalay Bay Casino in Las Vegas, with Kenchi Ogawa of Japan and America's Tevin Farmer going head to head for world honors. The rangy Ogawa, 23-1 (17), was on the front foot throughout the contest, pushing back Farmer, 25-5-1 (5), until the championship rounds when the American refused to give ground. Farmer appeared to be the more skilled and accurate fighter but after 12 rounds were completed, the judges favored Ogawa on two cards, 116-112 and 115-113, while Farmer won the third 116-112, resulting in a split decision win for Ogawa. The verdict proved to be controversial and we can likely expect a rematch between these two boxers in early 2018.